Bristol has become a hub for solar deployment in the UK, with a number of public and private buildings - including the Science Centre (pictured) - having installed the technology. Yesterday the council launched an investment prospectus, entitled City Leap, outlining its search for external investment – up to £1 billion – to invest in Bristol’s energy infrastructure over the next decade. And while the lion share of investment is to be directed towards heat and transport, renewable electricity, and in particular solar, has been highlighted as an important investment destination. The prospectus references a study conducted in 2009 by the Centre for Sustainable Energy which identified the potential for more than 140MW of solar capacity in the city, split over installations on private housing (74MW), social housing (22MW) and commercial properties (46MW). A secondary study, compiled by The Energy Service, has reinforced the potential for installing solar on the council’s social housing, identifying potential for around 22.8MW of solar worth an estimated investment potential of £28 million. 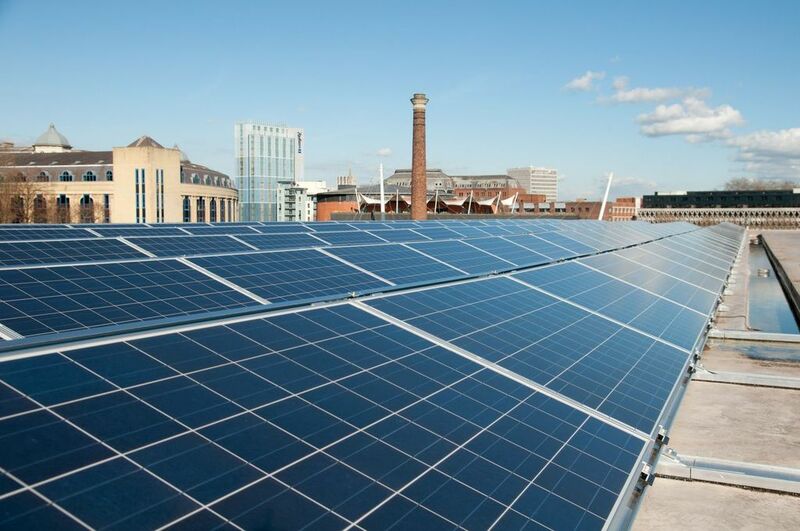 This has led Bristol’s City Leap programme to target the continued use of council land for renewables, financed using co-finance models such as crowdfunding, community groups, social equity and debt investors. The stated aim for these projects is to lower fuel bills for the council, while the potential for the council to enter into power purchase agreements to sell the electricity via its Bristol Energy utility also discussed. But perhaps more interestingly, the council has said that emerging peer-to-peer trading platforms are of “particular interest”, hinting towards the possible deployment of schemes similar to the Local Energy Marketplace trial Centrica is running in Cornwall and the blockchain-powered peer-to-peer project managed by Repowering London at Banister House in Hackney. Meanwhile, the City Leap programme will also look to continue the installation and facilitating of solar installs on private residential housing and corporate buildings throughout the city, possibly alongside battery storage. Overall, the City Leap programme has estimated that as much as £40 million could be invested in the city’s renewables infrastructure by 2027. Kyle Dudd, cabinet member for energy and waste at Bristol City Council, said the city wanted to “take things to the next level” as a leader in energy, but it needed partners to do so. “We want to use our role as local government to act as a catalyst for change. In return for partnering with us, businesses would get a chance to shape the future of the city’s energy system and unlock opportunities to gain a return on their initial investment,” he said. Those interested in investing have until 31 August 2018 to do so.